I've held onto this quote for a while and in wanting to share it with you, I looked up the context. I just went down a rabbit hole of Norton Juster quotes, and as you all probably know, the above quote is from his famous children's book The Phantom Tollbooth. Somehow, in nearly 46 years, that book has escaped my reading list - until now. Have you read it? What I love about that quote pertains to travel, yes, but it's not really about the places we go, it's who we become during the journey. That "in-between" place is a suspended place - not just a simple going from here to there. What do those moments of in between hold? What do we experience there? These little parcels of time are where we learn about ourselves, what we're capable of and where our weaknesses lie. The in-between is the seat of transformation and discovery. There's a whole process of deciding where we want to go; researching our destinations and buying the tickets are ways we set the stage for expectation. I just recently read that when we decide to take a trip, we should buy the tickets as early as possible. This purchase months and months away from the time of the actual trip extends the experience, it colors our days leading up to it with joy and anticipation. We truly are getting more out of our money spent. We have something to look forward to that puts a spring in our step and hope in our hearts as we mark the days off the calendar. Travel then becomes a reward for our spirit, long before we've even gotten on a plane or a train. Hiking Mount Olympus in Greece: I learned a great deal about myself on that day. One of my favorite parts of travel is expanding my tastes by exposure - not just in food - but in art and culture; the music of a place, the dancing, the traditions. When we are at home, we all have our favorite radio station, restaurants, museums, holiday rituals, etc. And when we travel to a new place, we are exposed to a spectrum of fascinating new things. As we return home, we carry those new experiences with us and then get to pick and choose what will stay with us and become part of our newly developed, expanded taste. W. B Yeats says, "The world is full of magic things patiently waiting for our senses to grow sharper." When I come back home to New York after a trip to another part of the world, there is a transformation that has taken place. What I discover about myself as I wake up to sunrises in a strange place and breathe new air, sleep in new beds, and dream new dreams changes me. When I travel, my eyes are more widely open for having seen a new land, my love and compassion muscles have doubled in size for having been exposed to people of another nation, my senses are sharpened for the things I've smelled, tasted, seen, heard, and touched. At the Ranakpur Jain Temple in Rajasthan, India. As glorious as hopping on a plane and getting a new stamp for our passport is, there's a brutality of travel that forces us to place our trust in strangers, leave the familiarity of our friends and family, come face to face with the unknown, surrender to not knowing the way, the language, the outcome... Sometimes we go away and come back and need a vacation from our vacation. We have to recalibrate, reset our internal clocks, reconnect with eating and sleeping patterns. We throw ourselves off balance on purpose to come back with a stronger center, a new appreciation for routine. I think the real shift that travel provides - the real transformation - is discovering what's been inside us all a long. I go away and always come back with a clearer sense of purpose and a greater sense of who I am and who I want to be. It's like I've tapped into a neglected state of awareness. I become more mindful and more present, more receptive to the world around me. My friend Amy Richards, who is like a daughter to Gloria Steinem, was interviewed recently. She said, "Gloria has this beautiful passage in her book My Life On The Road where she stops and puts her hand on a rock in Central Park and tries to remember all the people who also put their hands on that rock or where the rock came from. I think about that when visiting a place." Reading those words made me realize that we may not all have the resources - the funds or the calendar space - to book a trip. But there are inexpensive and easy ways to travel. We can go into our own back yards, to the beach, a forest, or our own local park and seek out the stone, twig, seashell, or whatever and let that object's imagined history take us on a journey. We can welcome even the tiniest transformation of self that comes from the smaller adventures if we allow our hearts and minds to stay open. That famous line is (misquoted) from Tolkien's poem All That Is Gold Does Not Glitter. It's thought to mean that to be a wanderer is to follow one's heart, to not have to know, to be free to wander off the beaten path. This is evidence of great strength, vision, insight, and courage. When people see one wandering metaphorically, most think that one is somehow lost, when the truth is, the real person was finally found. Many of my friends in New York City are from the Hare Krishna devotional community. This time of year is ripe with spiritual pilgrimages, temple visits, yoga retreats, extensive study and travel throughout India. 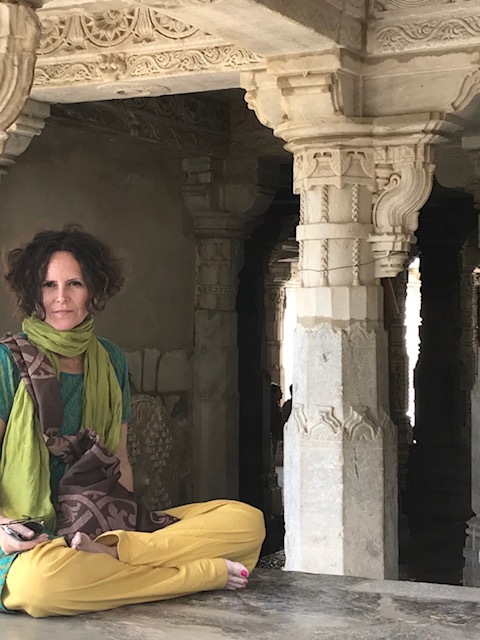 I normally take a winter trip to India but this year my lady-gang of travel companions and I decided to take a break from India, spin the globe, and find new adventures with our friends and family. I know as I travel to Germany and Amsterdam in May with one of my childhood friends, I'll be very happy about this decision, but right now, my heart is in India. At least once a day in India you are eating a bowl of daal or lentils. Lentils are a popular source of protein for many vegetarian Indian diets. Bread is made of lentils, they are cooked into a khichdi porridge or boiled with spices into a brothy thin soup. For years, I've been making lentils somewhere in the middle - kind of a heartier thick stew. Part porridge, part soup. While it's simmering on the stove, look up Scott's Cheap Flights and start looking for your next affordable adventure. My hometown bests from Missouri are in Australia right now as well as in the Netherlands from cheap flights found on Scott's site. They recently shared the site with me and everyday I go on a mini vacation in my mind looking at Scott's list of flight deals all around the world. Heat oil in a large soup pot over medium heat. Cook onion, stirring often, until softened and golden brown, 8–10 minutes. Add all of the dry spices and fresh ginger and cook, stirring, until fragrant, about 2 minutes. Add lentils and cook, stirring, 1 minute. Add the broth to the pot, stir to combine. Bring the mixture to a boil; reduce heat and simmer gently, stirring occasionally, until lentils are soft but not mushy, 20–25 minutes. Add the tomatoes and coconut milk simmer for 5 more minutes. Season soup with more salt and pepper and the cracked red pepper flakes if needed. Garnish with cilantro and lime.